Let’s not stop with just terrorism. If we can focus on restraining terrorism, Jay Gary asks, what is keeping us from tackling other mega-evils that cause a greater drain on the world’s health and wealth? Last fall President Bush began using the term “Evil-doers” to refer to those who traffic in terrorism. While terrorism has risen to the top of USA’s combat list, there is a host of mega-problems that we have failed to adequately tackle. This mega-complex of manipulation keeps up to half the world’s population in degrading poverty. This is not a new phenomenon. Nearly ninety years ago theologians referred to this quagmire of corruption, exploitation, and repression as “structures of evil.” More recently the pope has described this complex as the “structures of sin”-indicating that willful and organized greed lie at the heart of human misery. Lest we think the war on terrorism will cripple this complex of mega-evil, think again. Affluent Americans and Europeans carry out the bulk of embezzlement, financial fraud and money laundering, not destitute Arabs. This collectively costs us $25 billion a day. That’s $9.2 trillion per year, or 32% of the entire Gross World Product. 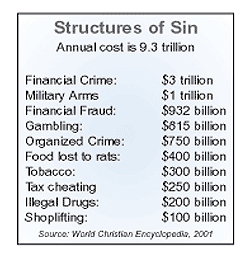 Imagine, 32 cents of every dollar is siphoned off by these “structures of sin.” This is not God’s will. Yet many believers today embrace a form of salvation that claims that God will only annihilate evil at the world’s end. They are waiting on God to act, when in truth, God is waiting on them. A religion that preaches that salvation pertains only to the “world-to-come” is not real religion, but fatalism. Jesus taught his followers to pray, “Thy kingdom come, thy will be done, on earth as it is in heaven.” He was not instructing Galilean peasants to beseech God for a better death, but for a better life. Without taking up arms, Jesus was rebelling against the status quo. He was standing up against the Herodian dominator system that was crushing Palestinian Jews. And he was promising that God would turn the tables in their time. Today in third-world countries there are 100 million people who can only support themselves by rummaging through garbage. Another 500 million live in squatter slums, with no plumbing or electricity. A total of 46% of the world lives in human misery, earning less than $1,000 per person/ per year. If our world were to collectively reduce the “structures of sin” just by 6%, it would free up some $583 billion each year, which would provide the entire world’s poor with adequate shelter, education, food and water. This is the great new fact of our times-that a small ethical change in our world system of selfishness could provide investments in adequate infrastructure for all humans to live above the poverty line. Is this just a utopian dream? Could it happen in the “here and now” rather than in the “then and there” of eternity? I believe it can if we stand up against postponement theology, and become an advocate for the poor in spirit. Unlike most theologians, Jürgen Moltmann has always strived to do his theology in a larger context. He writes, “Either long-term investment today for the future of life together or short-term gain today and the calculated bankruptcy of human-kind in the future.” For Moltmann, the alternative to social justice is growing criminality in the First World and increased costs for security. Just as our world is banding together to eradicate terrorism, we can band together to eliminate its causes. It is a matter of spiritual and political will. And that will depends on our will, because God is willing.